1. Click the Moderators tab in your channel's left sidebar. 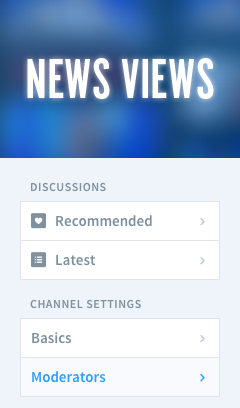 From here, you can manage the moderators who currently belong to your channel. 2. Enter the username and click Add and that's it!! Reminder: Usernames can be found via the Disqus user profile under the Display Name and starting with the "@" symbol. (Do not include "@" symbol when adding username as moderator). To remove a moderator from your channel, simply click the Remove button adjacent to your name in the list of active moderators. When adding or removing moderators, the user will also receive a notification confirming the change.